At Legacy Royalties, the process typically goes like this … An oil and gas mineral owner calls or emails and expresses a desire to sell. If the owner is receiving oil royalty checks, we ask for copies of the last 3 check stubs (the attachment to the check listing well names, county, state, oil and gas volumes, oil and gas prices, etc.). This gives us the information we need to research the oil wells and make projections on future oil and gas income. From this, we determine the price we can pay to purchase the oil royalties. Legacy Royalties then submits a verbal or email offer to the mineral owner. If the offer is accepted, we prepare a written offer to purchase the oil and gas royalties. Up to this point, the royalty owner is not obligated to sell and can simply walk away if desired. 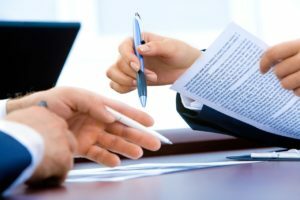 If the royalty owner signs the written offer, then the owner is obligated to sell and Legacy Royalties is obligated to buy as outlined in the written offer. After receiving the signed written offer, Legacy Royalties will complete the due diligence required to verify ownership and income. This usually takes about a week. If all is in order, Legacy Royalties will provide the oil mineral owner with a deed transferring ownership from the owner to Legacy Royalties. The royalty owner signs the deed, sends it back to Legacy Royalties, and Legacy sends payment to the owner. Legacy covers all the costs associated with due diligence, deed preparation and filing fees. That’s about it! The process is intended to be as simple and quick as possible for the royalty owner. From the initial inquiry to receiving payment, the entire process can be done as quickly as 1-2 weeks. If you are thinking of selling your royalties, need a mineral rights appraisal, or a free consultation regarding title transfer, estates with oil and gas royalties, or other general issues common to mineral rights and royalty owners – call us at 800-950-6954 and for more information, visit our website at https://www.LegacyRoyalties.com.